Hello friends! Candace back with you today to share a fun summer travelers notebook spread using the July Pool Party kit. You can checkout the the kit here in the shop and other kit extras here. This kit is perfect for documenting all your little summer memories. I wanted to document one of these summer memories in my spread today. As I was flipping thru the kit papers one of the geometric papers caught my eye. I thought it might look fun to cut the paper up and spread it across one side of the spread. After I cut the paper and adhered it to the base I was left with a perfect space for the title. For the title I used the puffy stickers from the kit along with a “little” acrylic piece from my stash. To embellish the left side of the spread I collected embellishments from the kit that coordinated with the colors on the cut papers. I placed the embellishments on the coordinating paper but on various angles to add interest and balance. For the right side of my spread I printed out the photo with a large white space on the bottom to mimic the look of a polaroid photo. I layered the photo on top of the sketchy blue paper in the kit. I placed my embellishment cluster on the top right hand corner of the photo and added a large “W” to symbolize my little guy’s name. Such a fun summer spread! I adore the colors in this kit, so refreshing and full of joy! Thanks for stopping by today! On you next spread try cutting up a geometric paper to drive the design of your spread. You will be surprised by how quick the layout will come together! Hello again! So happy to be back again sharing a little travelers notebook inspiration. This is quickly becoming one of my very favorite ways to document the everyday moments. For today’s spread I used goodies from the new travelers notebook kit & embellishments from the main kit. On father’s day I captured a little photo of my husband teaching one of my sons how to tie his tie for church. This was such a sweet and delicate moment and I wanted my spread to reflect this feel. I placed my photo on the left side of the spread layered over the beautiful marble paper from the TN kit. Under the photo I added sentiment word strips that captured my feelings about this special moment. At the bottom of the spread I added the date on top of a floral label. On the right side of the spread I used stamps from my stash to spell out my title “Dad & Son”. I adore the floral ampersand from the ephemera pack and had to make sure it made its way on to a project this month! To tie the two sides of the spread together I repeated the mint color and the floral embellishments. Another moment captured and documented in my TN! Thanks again for stopping by today! We would LOVE to see what memories you are documenting in with our new TN kits. Make sure you tag Clique Kits when you share your projects so we can swoon over them! Hello friends! Candace here with you today to share a quick travelers notebook spread. I love documenting little everyday moments in my notebook. Today’s moment captured and documented was my little guy going to preschool. To document this I used the new traveler’s notebook kit along with a few papers and embellishments from the main kit. To start the spread I punched three, 3 inch circles out of various patterned papers in the kit. I chose papers that were light in feel and theme to match my photo. 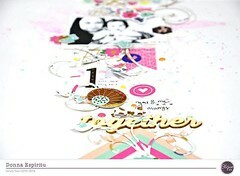 For my photo stack I layered papers & embellishments from the kit. I wanted the left side of the spread to feel very organic, like the papers and embellishments just fell on the paper. For the right side I wanted a more organized feel. I continued the circle theme with my embellishments, over lapping a few of the circles. I added a large “R” from my stash to represent my son’s initial. To tie the right and left sides of the spread together I repeated the acrylic white stars across the spread. Such a cute and meaningful layout! I love how it came together and the moment captured and now documented. Thanks for stopping by today! Give mixing styles a try on your next travelers notebook spread. Try mixing an organic and organized style all on one spread! Have fun!